The supreme court in Argentina has ruled that it is unconstitutional to punish people for using marijuana for personal consumption. The decision follows a case of five young men who were arrested with a few marijuana cigarettes in their pockets. But the court said use must not harm others and made it clear it did not advocate a complete decriminalisation. Correspondents say there is a growing momentum in Latin America towards decriminalising drugs for personal use. The Argentine court ruled that: "Each adult is free to make lifestyle decisions without the intervention of the state." Supreme Court President Ricardo Lorenzetti said private behaviour was legal, "as long as it doesn't constitute clear danger". "The state cannot establish morality," he said. The initiative has been supported by the government - Congress is expected to introduce amendments to the current drug laws. 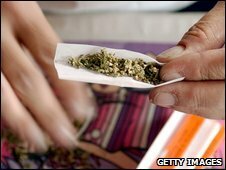 But the court said it was not advocating a complete decriminalisation of the drug - a move possibly aimed at deflecting criticism from the Church and conservatives, says the BBC's Candace Piette in Buenos Aires. The eight-page statement also called for a comprehensive policy against illegal drug trafficking. The move has been criticised by some campaign groups who say it will encourage damaging behaviour and lead to health problems. "There will be an increase in the drug trade and the people that fall into addiction will not, unfortunately, access treatment," Claudio Izaguirre, director of the Argentine Anti-drugs Association told Reuters. "My country doesn't have the necessary health coverage for what will happen," he said. Argentina's move follows rulings by several other countries across the region, including Venezuela, Ecuador and Colombia. Last week, Mexico enacted a law decriminalising possession of small amounts of drugs, including cocaine and heroin - the country is in the midst of a drugs turf war which has claimed more than 11,000 lives in the last three years. The aim of such moves is to enable police to focus their efforts on the big criminals in the drugs trade rather than dealing with petty cases, says our correspondent. But it also marks a shift a dramatic regional shift to the decades-old US-backed policy of running repressive military-style wars on the drug trade, she adds.